Be the first to share your favorite memory, photo or story of Alvira. This memorial page is dedicated for family, friends and future generations to celebrate the life of their loved one. 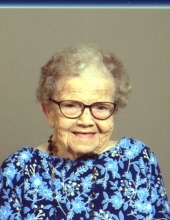 Alvira Thelma Clarice Henderson, 99, of Story City and formerly of Ellsworth died February 4, 2019 at Israel Family Hospice House in Ames. Funeral services will be Friday Febraury 8 at 10:30 am at Trinity Lutheran Church in Ellsworth. Burial will follow in the Homewood Cemetery. Visitation will be Thursday from 5 to 7 at the church. Alvira Thelma Henderson was born on May 21, 1919 in Kelley, Iowa to Martin and Clara (Queensland) Johnson. She graduated from Kelley High School and married Willard Henderson on June 26, 1943. He died October 17, 1998. Alvira was a member of Trinity Lutheran Church in Ellsworth and lived most of her life in the Ellsworth and Story City area. She enjoyed baking, needle stitching and embroidery, but her family was her greatest joy. Alvira passed away February 4, 2019 at Israel Family Hospice House in Ames at the age of 99. Alvira is survived by her two daughters, Mary Jane Hodnefield and Jacquelyn Young both of Story City; a daughter-in-law, Kathryn Henderson of Ellsworth; seven grandchildren, Lisa, Craig, Angie, Pam, Rick, Brian and Laura; 14 great grandchildren and two great-great grandchildren. She was preceded in death by her parents; Husband, Willard; a son, William; two brothers, Kermit Johnson and Mervin Johnson and two sisters, Martha Gilbert and Charlotte Johnson. In lieu of flowers memorials may be made to Homewood Cemetery or Trinity Lutheran Church. To send flowers or a remembrance gift to the family of Alvira Thelma Clarice Henderson, please visit our Tribute Store. "Email Address" would like to share the life celebration of Alvira Thelma Clarice Henderson. Click on the "link" to go to share a favorite memory or leave a condolence message for the family.